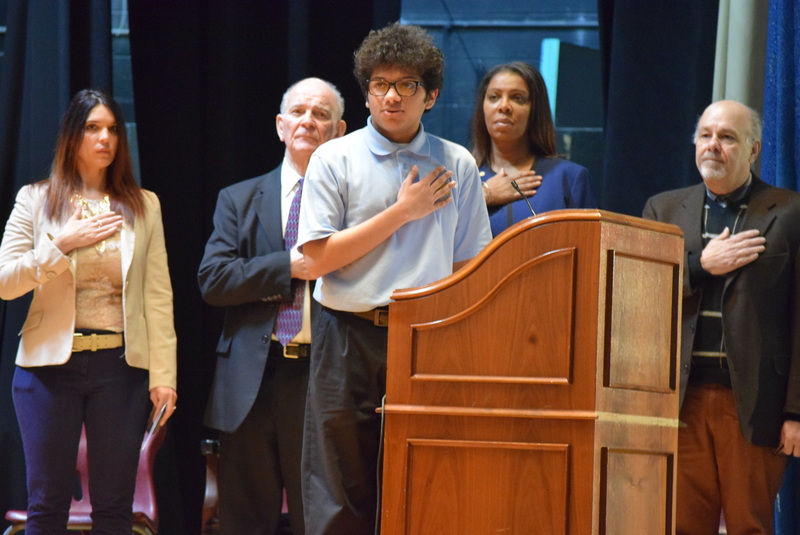 Seniors Jarlyn Rodriguez and Darryl Fuller were chosen to read Dr. King’s famous, “I Have a Dream Speech” during a schoolwide assembly, which featured James as the special guest speaker. James is the first woman of color to hold a statewide office in New York and the first woman to be elected attorney general. She previously served as public advocate for the City of New York, and when she was elected in 2013 became the first woman of color to hold a citywide office. “When I was your age, all I thought about was boys – Jerome and Tyrone, you know how it is,” James told students. “Then my brother was falsely arrested and I went to the courthouse with my mother. The first thing my mother asked was where was her son. She was told to shut up and sit down. The only people I saw that looked like me were other defendants. “That was when it hit me that Jerome and Tyrone can wait, I need to take my education serious, and it is when I discovered my calling was justice,” James said. Former State Senator Serphin Maltese, chairman of the school’s board of trustees, and Principal Geri Martinez, then presented James with a leadership award. “I ask all the young students but especially the young women in the crowd today to look up and see what is possible when you set your mind to a goal,” Maltese told the crowd. Rodriguez said she felt “very honored” to meet and shake hands with James. “It was a once in a lifetime experience that I got to meet someone like her,” she said. “She’s an inspiration to me and to people in my community that we can be successful, we can make it, we can take positions of power,” Fuller added. Calling Dr. King “the most important voice of the American civil rights movement,” Principal Martinez said he challenged people to ask themselves what they are doing to make this world a better place. Contributing to this story was Katie Engesser.